REACHING THE RUMORED WELL FACILITY, THEY DESCENDED IN SEARCH OF PRECIOUS WATER. This world was heavily inspired by Spec Ops The Line—a very generic name for a hidden gem of the game industry's story driven experiences. 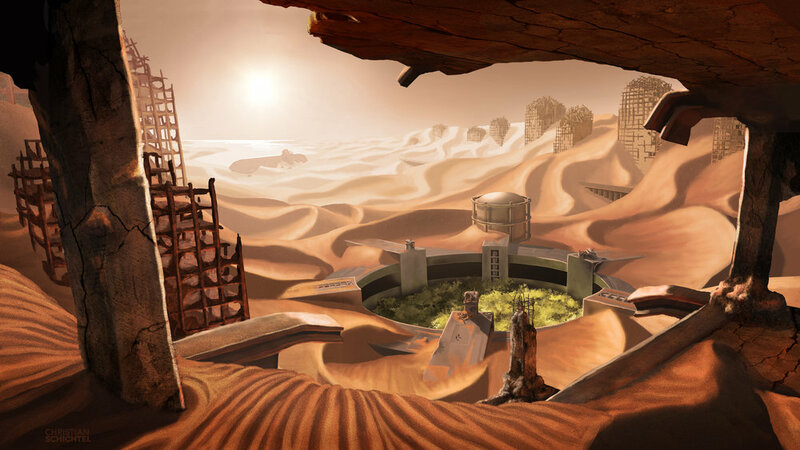 It takes place in a city torn down by sandstorms and the factions trying to survive within. I aimed at creating my own history to a similar sand apocalypse; The well facility, placed in the bed of what was the city's bay, was a response to the dwindling population's need for water. I added watchtowers then destroyed them to show that this place was regulated, then raided, and is now abandoned. The trees do a good job of adding mystery to the pit and their green contrasts well with the reds and oranges. The final touch and one of my favorite parts of the upper vantage are the tiny footprints in the sand. This is the first time I've created a series of paintings—linked by their characters and a location. It's an interesting task to do this because I had to take in account both compositions and make decisions based on what would work for both angles. Originally, I was going to have the lower vantage placed at the base of the trees—that didn't work well because I couldn't indicate very well that it belonged to the same environment; So I added the inlet just above the trees so we can get a good look at the surrounding buildings while retaining a strong sense of mystery to the pit. This facility represents a pocket of life contrasting with its dead and dry surroundings. The birds add to this idea while their startled flight reinforces the female character's landing from her rope rappel. I had fun getting the reference I needed for the characters. First I gathered a lot of photos online searching "bandits" and "scavengers", then I took over 200 photos of myself trying to get the right poses. This is tremendous help in getting a believable gesture as well as guiding in how the clothing folds rest on the form. Finding and creating makeshift props is fun too—a floor mop works well as a staff. Later on I started to control the lighting in the reference with my capable little desk light to further inform my darks and lights. For the capsule, I taped the handle and lid of a water jug together in order to block the light and give my hand something to interact with. Though, it's oddly a lot of fun to create a lightsource without going off of a reference—just looking at the curves of the form and further defining those shapes with light…very satisfying.